Official artwork of Elec Man from Rockman Complete Works. Elec Man (エレキマン, Elecman) is a character from the Mega Man universe who appears in Super Smash Bros. 4 as an Assist Trophy. When summoned, Elec Man runs and jumps about the stage, unleashing multiple Thunder Beam attacks. He fires three balls of electricity (one straight up, one straight down, and one forwards) that paralyze whoever it hits. Much like Mega Man, he uses his proportions from his original NES sprite rather than those of the official artwork. 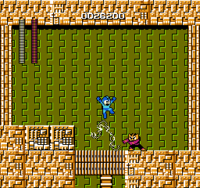 Elec Man battling Mega Man in the original Mega Man. Elec Man is one of the six (eight in Mega Man Powered Up) Robot Masters in Mega Man. Like most of the other Robot Masters, Elec Man was created by Dr. Light, Mega Man's creator, as an advanced humanoid robot to perform industrial tasks. In particular, he was designed to control energy usage in Nuclear Power Plants, and was often hailed as one of Dr. Light's greatest creations due to his razor-sharp calculation and judgment. However, he was reprogrammed by Dr. Light's former assistant Dr. Wily, as part of his plan to conquer the world due to his jealousy of Light's success. Elec Man is often considered to be one of the most difficult opponents in the original game; he is very quick and agile, and his Thunder Beam weapon is very powerful, being capable of destroying Mega Man in as little as two to three hits. He is weak to Cut Man's special weapon, the Rolling Cutter (or in Mega Man Powered Up, Oil Man's special weapon, the Oil Slider). Elec Man in action in Super Smash Bros. for Wii U.
Elec Man makes his Smash Bros. debut as an Assist Trophy in the fourth game of the series. When summoned, he will run and jump around the stage, occasionally sending out jolts of electricity in any of three directions: directly above him, directly below him, or directly in front of him. On some occasions, he will blast more than one in different directions, and rarely one in all three. If a jolt collides with an opponent, they will take damage and high knockback, enough to KO at the 70-90% range. These projectiles can be reflected. He will flinch if he is attacked, and attacking him enough will cause him to leave the stage early. Elec Man's trophy appears in both versions. In Super Smash Bros. for Wii U it is part of the Mega Man Trophy Box. Elec Man's trophy in for Wii U.
Elec Man's trophy in for 3DS. A robot created to help manage the power at nuclear plants. He specializes in directing power flow, handling levels of energy that would short out lesser robots. When he is called into battle, he'll zip around while firing his Thunder Beam in all directions. Don't get zapped! A robot created to control the voltage of nuclear power plants. He's sharp, speedy, and excels at commanding electrical currents (an unexpected forte for a robot). When you call on him in this game, he'll zip around, firing his Thunder Beam up, down and straight ahead. Anyone hit by the beam will be in for a shock! Elec Man does not return as an Assist Trophy, instead appearing as a Spirit. Elec Man as he appears in Super Smash Bros. for Wii U.
Elec Man is the only third party Assist Trophy in the series that doesn’t return in Super Smash Bros. Ultimate. Elec Man is the only Mega Man 1 Robot Master that doesn't have a remix in Ultimate. This page was last edited on February 21, 2019, at 04:10.